California born and raised, Jefferey became intrigued with true bridle horses at 12 years of age. He watched and listened as old-style vaqueros started young colts. He watched them use tapa ojos [blind folds] on horses snubbed to posts awaiting a saddle and first ride. He remembers the large Spanish spade bits, rawhide riatas and all the silver on saddles, headstalls and spurs those vaqueros used. Jeffrey feels privileged to have met and worked with horsemen who followed the old bridle horse traditions; they led him to learn and experience "vaquero style". By age 17, he ws working for three notable horsemen, old traditional types - training horses and working cattle slow and easy. Over the years, Jeffrey's desire grew toward keeping the bridle horse traditions alive and learning the art of hackamores, two-rein and using spade signal bits. 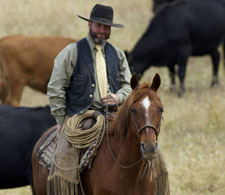 He, his wife and children moved to Oregon in 2003 to begin a small cattle operation embracing the buckaroo lifestyle - the open rodear work, riata roping, single rig saddles and long bone horses - all rooted in California's early vaquero era. In 2014, he & his family returned to California when offered the job of ranch manager on the historic El Rancho Cienega del Gabilan, a working cattle ranch in San Juan Bautista. They reside on the ranch today, and he continues to follow and respect the early vaquero traditions in horsemanship & stockmanship. Jeffrey refers to a "balance approach" which he puts in play every day whether working cattle or training horses. Having a balance of gear and a working system gets results. His gear is all about design which allows a shift of weight to send signals to his horse, little movements, quiet, slow. His horses are put away soft as when they started. It's interesting to see and put this balance into practice; he takes the time it takes, keeping bridle horse traditions alive. Jeffrey will be horseback at Vaquero Heritage Days 2018. Check the schedule for Saturday & Sunday horsemen expos. Learn more about Jeff Mundell, visit the outdoor "horsemen's booth" during the event.